On the full moon of the month of “Shraavan”, a burst of colour makes an appearance on boys and men alike, with multi hued rakhis tied on their wrists. The festival of Rakshabandhan, celebrated on this day, speaks of the relationship between brothers and sisters. Sisters tie a Rakhi, or holy thread, on the wrist of their brothers, reinforcing the special bond between the siblings. 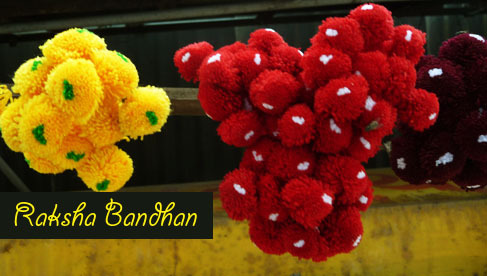 As with most Hindu festivals, the origin of Rakshabandhan is also believed to be based in ancient mythology. On the full moon day of Shraavan month, the deities and demons had a battle. To protect Indra, the king of deities, his wife, Indrani, tied a talisman on his wrist. The deities won the battle and a tradition of tying a “Raksha sutra”, or protective thread on the Shraavan Poornima (full moon) day began. Around 3000 B.C., the Aryans had the tradition of performing a “Yajna”, a ritual worship before any war. Before the men departed to the battlefield, the women would tie sacred threads for their protection and security. This custom spread to the rest of the country and slowly evolved to the festival where sisters would tie the sacred thread around their brothers’ wrists to ensure their wellbeing, and the brother would promise lifelong protection of the sister. 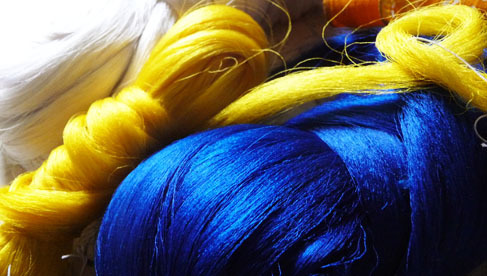 Both mythology and history have had many instances where this simple thread saved the lives and honour of women. A strip of her sari, tied around Krishna’s bleeding finger saved Draupadi’s honour years later. Goddess Lakshmi tied the sacred thread to king Bali to seek refuge, when her lord, Vishnu, had left his abode in Vaikunth. Yamuna tied the rakhi to Yama to bestow upon him immortality. History also has some great examples where a Rakhi was powerful enough to stop wars and destruction. King Alexander’s wife sent a rakhi to Porus, to ask for her husband’s safety in battle. Probably the most famous story is of the Rajput queen Rani Karnavati, who sent a rakhi to the Emperor Humayun, who immediately came to her rescue. It was not just an instance of a rakhi creating new relationships, but also a strong bond across religions. This Hindu Muslim solidarity was also reaffirmed during the Indian Independence movement, when not just brothers and sisters, but every patriotic soul tied rakhis as a symbol of unity among all faiths. Today, Rakshabandhan is celebrated all over Northern India with a great deal of enthusiasm, especially among children. It is remarkable that even though this festival occurs only once a year, the manufacturing of Rakhis goes on all year long. It is a good source of adding to thehousehold income for a large number of women. 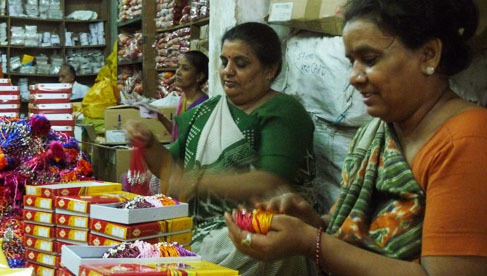 In Ahmedabad, for instance, one manufacturer of Rakhis gives year round employment to about 500 women. 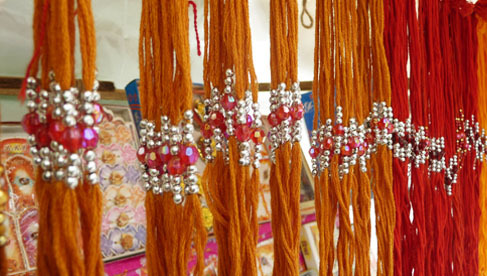 A Rakhi is essentially a piece of coloured string, with some kind of decorative element in the centre. The raw material is sourced from different parts of the country and assembled by these women into beautiful designs. They take the material home and after finishing their household chores, sit with neighbours and friends and make rakhis, making profitable use of their spare time. Sometimes children and men also get interested and help them out. 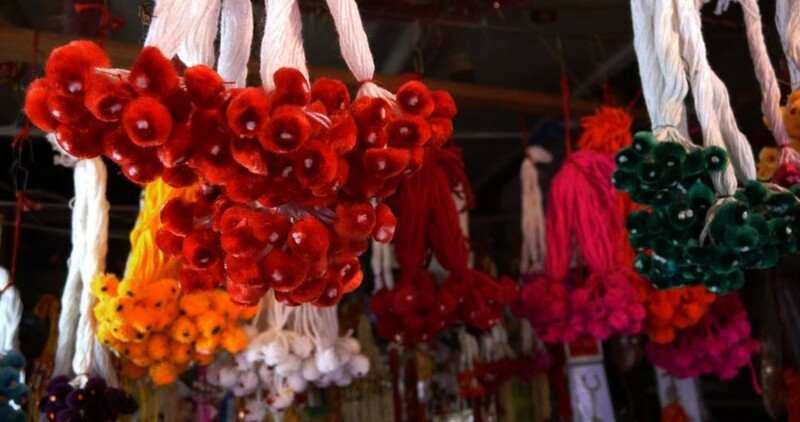 Although each craftswoman can make up to a thousand rakhis in a day, the production goes on throughout the year and sales go on for six months, such is the demand for rakhis. Indian women have always had constructive ideas for utilizing their free time. After finishing household chores, women in a large joint family or a small neighbourhood would come together and catch up with stories of daily life, while making something of utility or decoration. Whether it is cleaning grain, making papads or sweets, or knitting clothes for the winter and making embroidered quilts or dowry items, women have beautiful ways of making the best of their time. 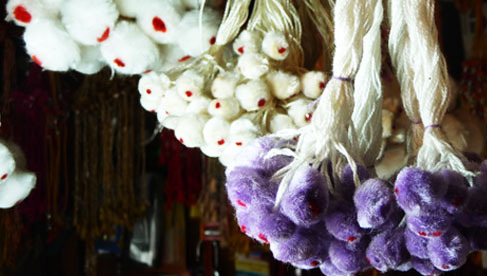 Traditionally made with tie dyed cotton yarn in red and yellow colours, now rakhis have metamorphosed into many different variations, with smooth synthetic threads, colourful ribbons and shiny beads and tassels.Women who make these rakhis have been noticing changing trends every year. While stone and crystal studded rakhis may be in demand one year, metal rakhis may gain popularity the next. Rakhis with cartoons and cutesy figures are popular among children, while some like the ones with colourful plastic beads that spell “friend”. Rakhis are also exported in large quantities, for there are so many Indians abroad, who want to keep their traditions alive. With changes in communication patterns, this craft is able to reach any destination not just by mail, but also through online portals. Today, these dainty threads find their way across continents, strengthening the bond between brothers and sisters, just as they have been for centuries.